On Sunday mornings, Mexico City's Reforma Avenue is open only to cyclists and pedstrians to reduce air pollution and promote physical activity. Photo by i_amici. It is crucial to develop a robust, simple and meaningful set of indicators to measure the impact of transport policy on public health in order to achieve any real change in the status quo, according to Dr. Carlos Dora of the World Health Organization during a meeting yesterday with staff from EMBARQ, the producer of this blog, during the week of the Transportation Research Board’s 90th Annual Meeting in Washington, D.C. Dora also spoke at The World Bank for this afternoon’s Transforming Transportation 2011 conference, an annual event hosted by EMBARQ and its partners. Another scientific review and set of recommendations is being made for the health impacts of transport policies. A final report is expected in April this year. Transport is important for public health because of a number of connections. Every year, 1.2 million people die in traffic crashes each year. And physical inactivity is responsible for 3.2 million deaths and 19 million healthy life years lost annually. Other health risks come from outdoor urban air pollution, traffic injuries, traffic noise, climate change and non-communicable diseases, like heart disease and diabetes. Dora also mentioned the lack of access to vital goods and services, as well as social networks, equity and cohesion, as being a “profound and under-reported” global health risk. There are large global investments in transport. From 2002 to 2004, more than half (66 percent) of the average annual lending from The World Bank went to roads and highways. But by and large, these investments are not for roads designed for pedestrians or cyclists, who are the most vulnerable users of the road, especially in developing cities. What’s more, investments in transit, cycling and pedestrian infrastructure are not well tracked. Contrary to popular belief, more road space actually leads to more congestion, not less. This creates a “vicious cycle,” Dora said. He gives the example of parents who fear that their children will be hurt on their walk to school, so they drive them by car, instead, but this makes congestion even worse, and children become even more physically inactive and obese, thereby exacerbating the public health problem. WHO’s plan to investigate the link between transport and health is to first complete the evidence review of studies and models, then establish an international working group of cities, development banks and NGOs that have the practical experience and science to define the indicators. These indicators will then be piloted in Asia, Africa, Latin America and the eastern Mediterranean. Current indicators of transport usually measure how well transport systems move vehicles, not how they affect people. These include measurements like kilometers of paved road, average speed or rates of car ownership. But better indicators that would help us understand transport’s relationship with public health would include other measurements, such as kilometers of separated cycle lanes, number of sidewalks, or the level of service of public transport. “It’s a different look at the same kind of picture,” Dora said. Take the index of integration of a particular neighborhood that might measure social cohesion or access to jobs and schools: Appropriate measurements for this might include the percentage of essential goods and services within walking distance or the number of weekly social interactions. “It may sound funky, but in fact, these are the things that really make a difference for health risks,” Dora said. 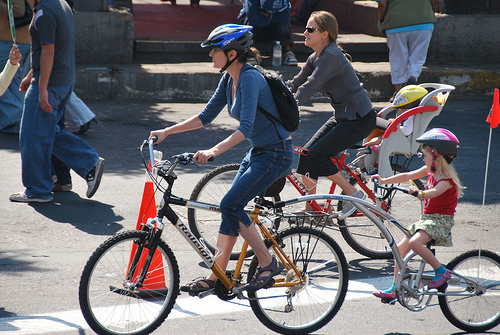 The public health impacts of transport can be examined from many perspectives. From an economic standpoint, you can measure how much money a country spends per disease, the number of lost days of work and the cost of years spent with a disability. WHO has even developed a tool, known as the health economic assessment (HEAT) tool , to estimate the economic savings resulting from reductions in mortality that result from cycling. There are countless other models that measure other indicators. “The risk with this is the process can get very statistical and complex and people will miss the meaning of what’s there,” Dora said. Dora also made the case for using language commonly found in climate change discourse, like “Measurement, Reporting and Verification (MRV),” when discussing the public health impacts of sustainable transport. “We need exactly the kind of rigor and transparency that people looking at climate change verifcation want,” he said. This is especially important for opening up a pool of Climate Investment Funds, including the Clean Technology Fund, for transport projects, which require specific references to co-benefits, including those related to health. The problem is that data are not always available, specific enough or collected on a large scale. For example, the commonly used International Physical Activity Questionnaire (IPAQ) was created to assess phsyical activity, but it wasn’t designed to look at transport-related physical activity, so it has some limitations. Another example: When measuring air pollution, some organizations, including EMBARQ, may collect information on commuters’ exposure to air pollution on a specific transit corridor, but a lot of health risks and benefits actually come from small improvements in air pollution across a large population. Therefore, “by focusing on only the users during a specific time of day, you could have some under-estimates,” Dora said. A better indicator would show the benefits of using a public transport system, like a bus rapid transit (BRT) corridor, expressed as the overall reduction in air pollution that the new system would cause as a result of less congestion and fewer people using cars. When anyone makes claims about how sustainable transport improves public health and safety, it has to be tied to proof. “Really what we’re doing is creating accountability and transparency in a way that helps individuals,” Dora said, stressing the importance of being transparent about the reliability of data and reviews of scientific literature.